'Love will tear us apart' was originally recorded by the British band Joy Division in 1979. The lyric ostensibly reflect the problems in frontman Ian Curtis's marriage to Deborah Curtis, as well as his general frame of mind in the time leading up to his suicide in May 1980. Deborah Curtis had the phrase 'Love will tear us apart' inscribed on Ian Curtis's memorial stone. 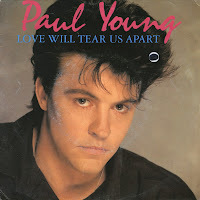 Paul Young took on the task of recording a cover version of the song on his 1983 debut solo album 'No parlez'. Although his version lacks the macabre undertones of the Joy Division version, it's still a reasonably good effort. The track was released as a single in the Netherlands only, reaching number 25 in the Dutch Top 40.